A child’s ability to learn is dramatically impacted by their vision. However, children’s vision problems can easily go undetected. In fact, a child may have 20/20 eyesight and still have a vision problem. Most children do not know what good vision looks like, so they may not tell you they cannot see clearly. Over 60% of Canadian parents mistakenly believe they would recognize their child’s vision problem. Only a Doctor of Optometry can tell how well your child can see. Rather than look for subtle signs of vision issues yourself, call Modern Eyes Optometry today to book and OHIP-covered eye examination for your child. Modern Eyes Optometry is a family-friendly office; we provide comprehensive eye examinations, advanced treatment plans and personalized eyewear solutions for all ages. 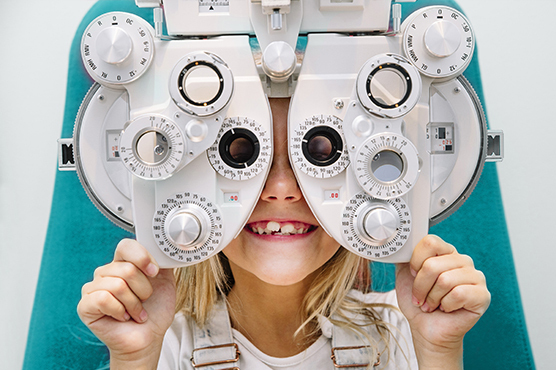 During a pediatric eye examination, our optometrists assess vision, muscle control, and eye health, all while helping your child feel comfortable and calm. Because children do not necessarily have the verbal skills to communicate what they are seeing or how well they see it, our optometrists employ examination techniques that provide us with the information we need non-verbally. How Often Do Children Need Eye Examinations? Strabismus is a misalignment of the eyes, causing one eye to point upward, downward, outward, or inward while the other points forward. This problem occurs due to uneven tension in the eye muscles or a neurological issue. Strabismus may develop into amblyopia if left untreated. Amblyopia is an eye teaming problem, often referred to as a “lazy eye”. When the brain receives two different images from each eye rather than one unified image, the brain attempts to simplify the process and begins to ignore the signals from one eye. This causes poor development within the vision processing unit in the brain. At Modern Eyes Optometry, we carry Shaw lenses: a speciality lens designed to help correct certain types of amblyopia. The use of Shaw lenses improves eye teaming, when compared to patching therapy, and also eliminates the embarrassment or anxiety of wearing an eye patch. More commonly known as nearsightedness, myopia is a refractive error that is becoming more common among children. When the eyeball is too long in relation to the curvature of the cornea, it causes light to focus on a point in front of the retina, rather than directly on it. As a result, the child cannot see distant objects clearly. Modern Eyes Optometry participates in a number of programs designed to offer your child the best possible eye care. Modern Eyes Optometry’s optometrists, Dr. Joel Schaefer and Dr. Bruce Foley, are proud participants and supporters of the Eye See…Eye Learn program. Children under the age of 16 receive 75% off the cost of lenses on their second pair of prescription glasses. Learn more about our other current promotions. Exposure to the sun’s ultraviolet (UV) rays is cumulative and can cause permanent damage to your child’s eyes and overall eye health. Invest in lenses that provide proper protection so they may enjoy the great outdoors safely. Modern Eyes Optometry offers sunglasses with 100% UV protection.